Sunny Shokrae's inspired abode is packed with worldly accents. For photographer Sunny Shokrae, her Iranian heritage is deeply rooted within the design of her home. The townhouse—which sits on a “beautiful brownstone block with the nicest neighbors we’ve ever had,” as Shokrae cites it—is situated in the Brooklyn neighborhood of Bedford Stuyvesant. Built in 2005, the duplex, which Shokrae shares with her husband, Ryan Kelley, and their 9-month-old son Leo, is roughly 1,183-sq-ft and features a decorative scheme that reflects the couple’s taste. However, that is not to say that either one didn’t have to make a compromise or two when it came to decorating it. “We can both be very alpha when it comes to taking control so we’ve talked over certain details over and over until either we compromise or one of us gives up,” says Shokrae of having had to combine her decorative style with that of her husband’s—a goal which the couple successfully accomplished. Take one look around the home and it’s obvious that the duo managed to seamlessly integrate their differing aesthetics, one that resulted in a tasteful and cohesive finish. Shokrae, who was 7-months pregnant when they first moved into the home, found herself faced with a space that had come out of a very poor reno. “There used to be a brownstone where we live now but it burned down and they built a townhouse in its place in 2005. Since then it was bought and flipped (flipped very poorly, unfortunately),” she recalls of the original state of the home. As far as decorative aesthetics go, there is something to be said of maintaining a design scheme that still manages to yield a family-friendly atmosphere—especially when the younger ones are involved. Such was a factor Shokrae kept top of mind when it came to decorating her home. “We try to be intentional with what we bring in for him. I think the biggest help has been passing things down as quickly as possible once he’s outgrown it—clothes, toys, gear, etc,” she says of her intention to strike the delicate balance between designing a space that is family-friendly yet design-forward. Of the eclectic slew of found objects abound, it’s clear that Shokrae’s Iranian roots play a major role in her decorative style. Naturally, worldly accents are ever-present, imparting her space with an impressionable and unique quality. “It’s instinctive and sometimes impulsive, but always edited down,” she notes of the thoughtfully curated quality her space embodies. In the dining room, Marcel Breuer dining chairs surround the statement-worthy table set atop a rug that Shokrae scored on eBay. On top, a set of antique candle holders come paired with cobalt blue candles, which result in an effortlessly chic color combination courtesy of the piece’s unique metal finish. To complete the scene, a cheeky painting that Shokrae procured from Bali, which draws on the tones of the area’s inspired palette, further informing the stylistic direction of the room. Keeping in line with the idea of taking a family-first approach to the design of her home, Shokrae was adamant in sticking to said decorative form, especially when it came to the living room. Given the open floor plan layout, it was crucial for the couple to establish zone-specific areas throughout. Enter their eclectic array of collected woven floor pieces, which brought on a bold dose of texture and style. They began with a handful of traditional Iranian rugs, which the couple received as wedding gifts (they are now located in the bedroom and nursery) and then slowly began to grow their collection from there on. 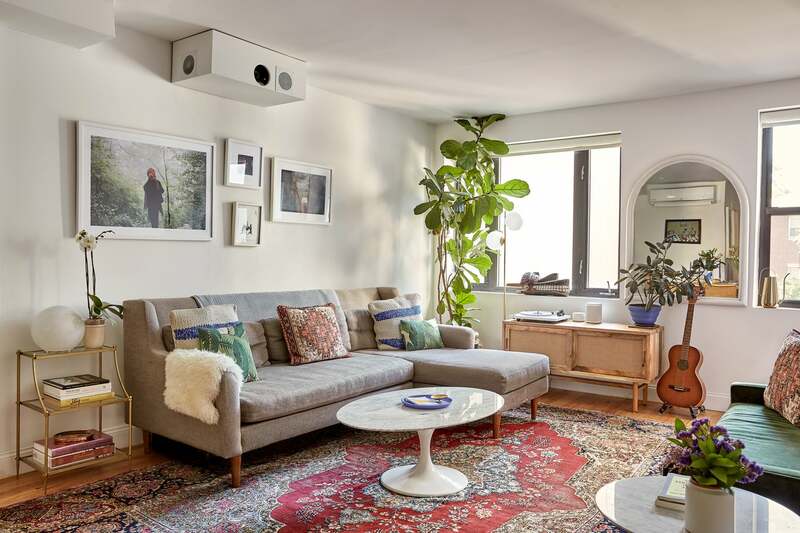 “We needed something for the living area that wasn’t too precious because we knew there would be spills on it, so we bought a used one that was very beat up and steam cleaned it, then we started stalking eBay for rugs to fill other spaces that seemed naked,” notes Shokrae. The kitchen, which sits directly adjacent to the living room, boasts a relatively pared down color scheme, one that allows the eye-catching elements of the surrounding rooms to take center stage instead. The off-white finish of the cabinets blends right in with the whitewashed subway tile that comprises the backsplash, completed by the stainless steel appliances and chrome pulls and fixtures. Drawing from the palette implemented in the kitchen (as well as the remainder of the home), the master bedroom boasts a similarly inspired scheme. Vintage prints, hanging greens, and decorative accents that come in Shokrae’s signature cobalt blue are just a few of the design elements that comprise the serene bedroom. Given that those details are not too far of a cry from the home’s established scheme, it’s easy to draw parallels from room to room—the cohesiveness being the result of a thoughtful approach to how Shokrae and her husband chose to tackle on the design of their abode. The bedroom’s stylistic direction was one that heavily relied on details and personal touches, two elements which Shokrae put a heavy emphasis on, with a focus on the proportional configurations of the items involved. “Everything else should be size appropriate: for example, the size of the bench at the end of the bed is just right—not too wide, perfect height, and slim for the space it occupies,” she adds. As stunning as the interior is, the true hidden gem of the home can be found within the exterior. For as rare as an outdoor space can be in New York City, stumbling upon one as well-designed as Shokrae’s is equally so. And if that weren’t enough, imagine our surprise when we happened upon the fact that the family is blessed with not one but three outdoor areas earmarked for leisure. The deck, which is situated off the kitchen, overlooks the backyard the family shares with their tenants—an area that’s all about comfort with entertaining in mind. The former of the two was designated as a spot where the family could enjoy breakfast in the mornings or retreat to for a little fresh air throughout the day. For as perfect as it sounds, it’s no surprise that Shokrae considers it her favorite spot in her home, citing the open sky and the constant breeze as two primary reasons for such. Two very rare and highly-coveted elements in the city. All in all, Shokrae’s home is one she refers to as a work in progress, proving that the design process is one that is never truly complete. “A pendant for above the dining area, wainscotting, floor and crown molding…there are so many things on the back burner until after we get some real serious things taken care of,” she adds. Be that as it may, we think her home is perfect as is.